July 4th, the great day of our nations’ recollection of independence and freedom, is celebrated annually at Marycrest Manor with festive jubilation! 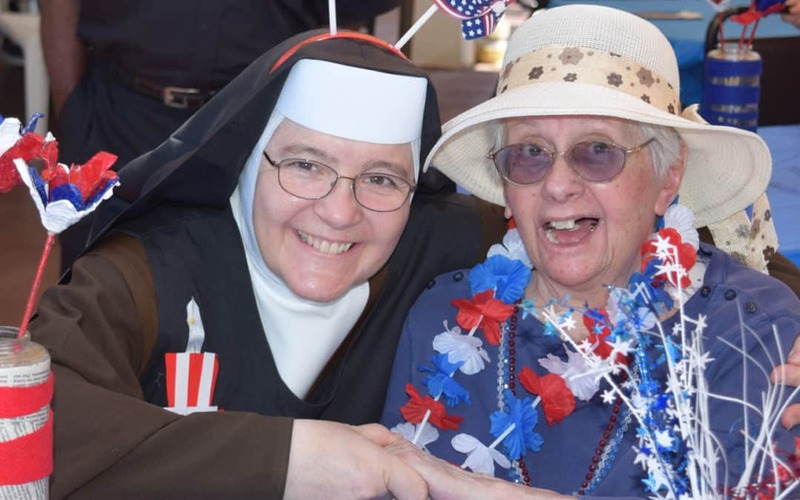 The residents dress for the occasion of our annual barbeque luncheon and enjoy to incredible charbroiled burgers and hot dogs cooked by “nun-other ” than our Sr. Lucy Marie. The delicious cuisine is served with all the fixings of a classic all American barbeque complete with an American flag Jell-O dish. Following our luncheon, it has become a tradition to lead the residents on a parade around the home while listening to the classic John Philip Sousa’s “Stars and Stripes Forever”. After the parade, there is always time for a sing-a-long of traditional national hymns. The pictures in the slide show capture the festive event and the joy that the residents and guests have while celebrating our nation’s liberation meanwhile beaming with pride as they recall how much they love to be American. We hope you enjoy the rest of these summer months and the blessings of family, friends, and fun!